Over-optimisation Does Pinterest Really Drive more sales than Facebook? In the same post, there were notes on the depth of content on web pages being a key determinant of quality – points about whether a piece of writing contained a balanced opinion, or had been properly spell checked. This is pretty much stuff that any serious business should be focusing on anyway. Think about a restaurant. If the floor is dirty and the waiters are rude and can’t answer questions about the ingredients, you’re not going to trust them enough to eat there. Google explicitly stating that outbound links to sites they consider to be spam will penalise you. Recently, we had the situation where large link networks like Build My Rank were getting smashed into millions of glittering pieces. Those networks were obvious spam. They used spun content, and posted largely unrelated links into the text which didn’t benefit users of the sites in anything other than the regard of getting away from the crap they were looking at. 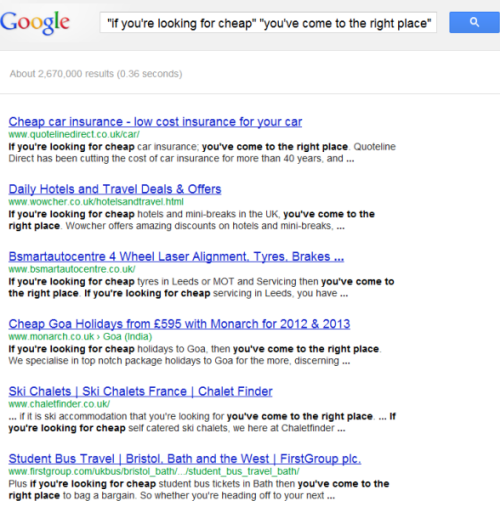 Google have talked about a notional 3% of queries being affected by this change compared to the 12% or so from Panda. That’s interesting because it suggests that it’s more targeted to the kinds of terms that are being actively optimised for rather than the broad strokes impact of Panda that seemed to be more aligned to reducing the value assigned to low quality content that targeted long tail variations with large numbers of pages. From my reading of the situation, it looks as though there’s a kind of cascade effect through the different stages of web spam that is being handled by Penguin. Websites with what is assessed to be low quality content that is either spun or poorly written (a la Panda) are being penalised actively, and the outbound links from those websites are being wiped out. This results in the sites which rely on those links seeing an initial drop in their rankings. Subsequent to this drop, the sites which are using this technique are being reviewed separately, and having a further ranking penalty based on the % of their activity which is spammy. This type of content structure is rife on the SEO friendly web. It’s easy to write, and as a result lots of people write it. Or use subtle variations of it across their site, which to an algorithmic eye might seem to be spun. When you add to this the type of blog spam links that get submitted with a little bit of flattery to the writer, you get a situation with a false positive spun content issue, and also outbound links to unrelated and spammy websites that Matt Cutts alludes to in his post. Google have added a form for people who think they’ve been unfairly penalised by penguin. It’s here. Seems like one of the biggest problems is footer links on irrelevant websites normally put there to share page rank, but I get the feeling that sites that produce things like wordpress themes will be hit also as they must have millions of links on irrelevant sites promoting their themes. I don’t disagree with you, especially on the footer links in WP themes. A lot of people will be using the themes without necessarily knowing that those links are actually there, and potentially linking out to sites that fall into a spam category.